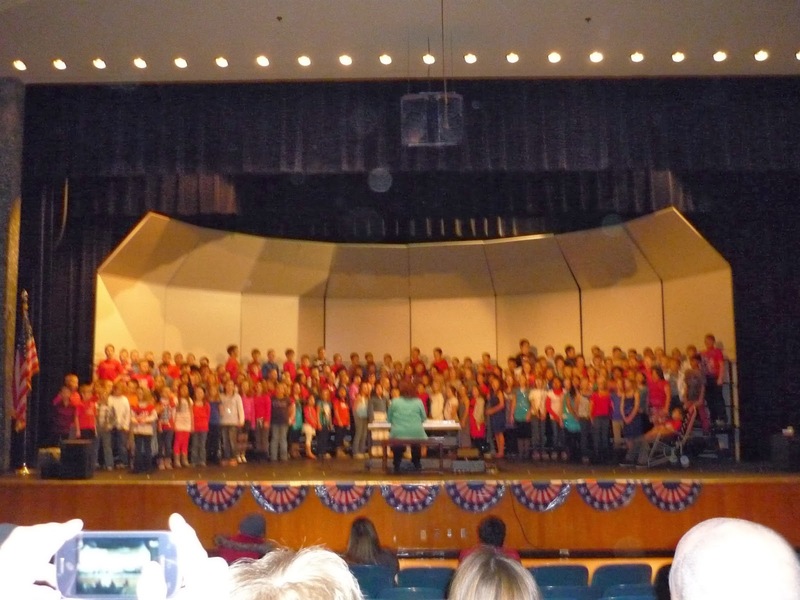 Last evening we drove 100 miles to see our granddaughters, twin 9 year-olds, in their school’s vocal music program. The travel went well and with time to spare we found a parking space and walked to the high school auditorium. I had spent several moments during the day imagining the excitement that was building in our girls, and all the kids. When we entered the foyer we were hit by the electric sound of children wired to the max. We made our way to the roomy, modern auditorium and it tingled with chatter and laughter. 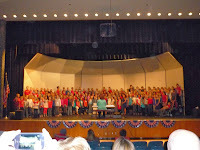 Grades three, four and five filled the first several rows. We found excellent seats in the exact middle and were told by Harley that she could see us from the stage because we were directly under a light. That was satisfying. She and Brett were also in the middle. I found myself feeling grateful for the appropriateness of the program on Veteran’s Day. Songs popularized during the different wars provided the theme. Brett had wished for Yankee Doodle but the third graders did that one. Fourth grade got Boogie Woogie Bugle Boys. All the grades sang the songs for the individual branches of the armed service and vets were asked to stand while their anthem was sung. Each was given a small flag. We went directly to a frozen yogurt place and I was overwhelmed with the options. There were 18 flavors of frozen yogurt – then toppings – then fruit – then syrups. They weighed your cup and you paid by the total weight. I have gratitude for a nine-year-old who isn’t obsessing about the material options that we know are being presented to all of us. I have gratitude for the promise and innocence of children. I am thankful for the magic of music. I have gratitude our country and its freedom to love and worship God in the way each of us finds the most meaningful.